The world has fifty five species of pheasants, almost all from Asia. One of the great things about these large birds is that the male of each species grows at least four different interesting types of feathers. And half of the males and females grow totally differently colored and patterned feathers. 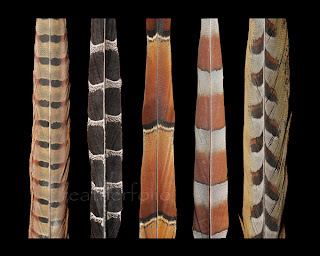 Let me see, that’s over 300 interesting different kinds of feathers to work with! Long-tail pheasants have long tails – like the ringneck pheasants people hunt and also pure black and white stripes tails from Mikados that live only in Taiwan, and a Copper that live only in Japan. Peacock pheasants are perhaps an ancestor of the peacock but a lot smaller and withbright round eyes on their tails. Tragopans have little round spots all over, some are a bright red with round white spots and one is black with round white spots. Junglefowl are the ancestors of chickens. Three species of peacocks, the Java Green, the India, and the Congo which looks a lot different and is the only pheasant originating outside Asia. It is from Africa. I had a male Impeyan Pheasant, a stocky species that lives high in the Himalayas. It escaped my cage one day and flew into a neighbor’s grass hay field 1/3 mile away. A normally colored bird would disappear, blending in with the deep grass and I never would have found it. But the Impeyan’s brilliant metallic feathers showed like a beacon. I imagine that this bird’s metallic and reflective feathers led to the demise of many of its kind. So its advantages of attracting mates must outweigh this major disadvantage.